How many times per day do you check Facebook or Twitter, just to see what’s happening in the world around you? Probably too many to count. 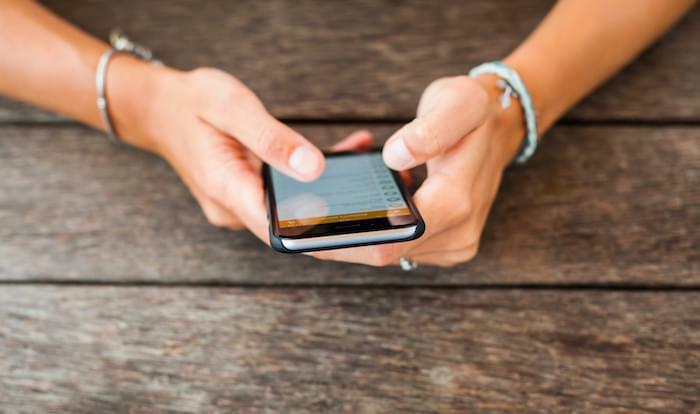 Social platforms have made such an impact on our lives that we’ve developed a habit of checking them and can’t imagine spending a day deprived. What if you could accomplish the same for your brand? 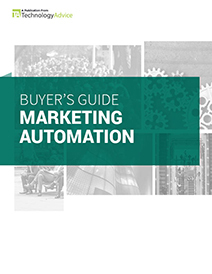 It turns out, you can — with marketing automation. Probably the best two known books on this subject are Nir Eyal’s Hooked: How to Build Habit-Forming Products and Charles Duhigg’s The Power of Habit: Why We Do What We Do in Life and Business. The theory they put forward is that habits can in fact be made or altered, and that companies can benefit from that. If you do something for long enough, it can become a vital part of your daily routine. That could be something like smoking, going for a walk before bed, or using your favorite social platform. As you might have realized by now, this is exactly what modern digital companies want. The benefits of this approach are clear in both directions: the more time users spend in their software, the more information or ROI they (and you) get in return. On top of that, as the users get “hooked” on the product, the likelihood they’ll switch to something else gets significantly smaller. 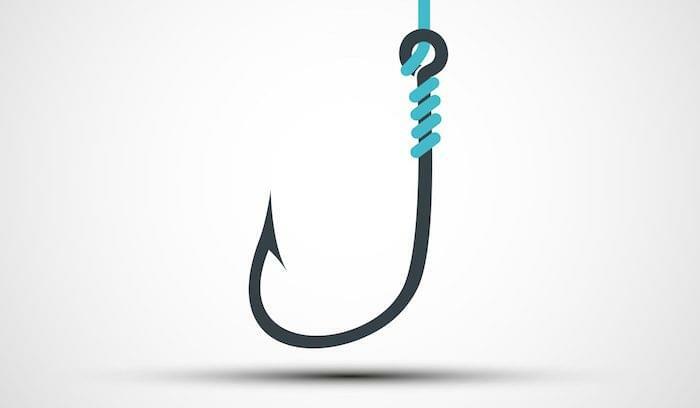 So how can get your customers hooked on your service? Let’s take a look. 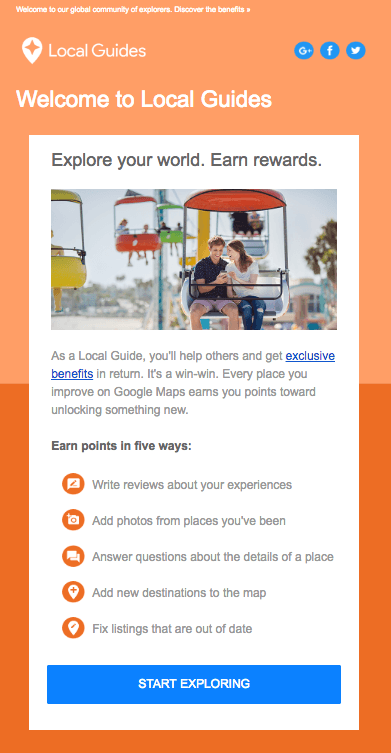 Getting users onboard isn’t just about pointing them toward a login page. 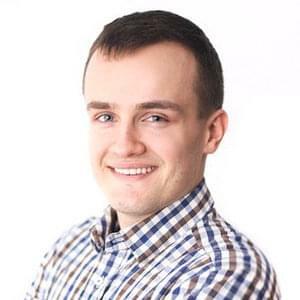 If you don’t want to waste the resources you’ve already invested in obtaining new leads, you can’t just hope they’ll feel the need and remember to go to your site. You need to facilitate this decision. What you need to do is to create a solid onboarding strategy. Use tools such as automated emails, in-app messages, or feature tutorials to show your new users around. Through this, you can get them to act when they’re still engaged and interested in your product. 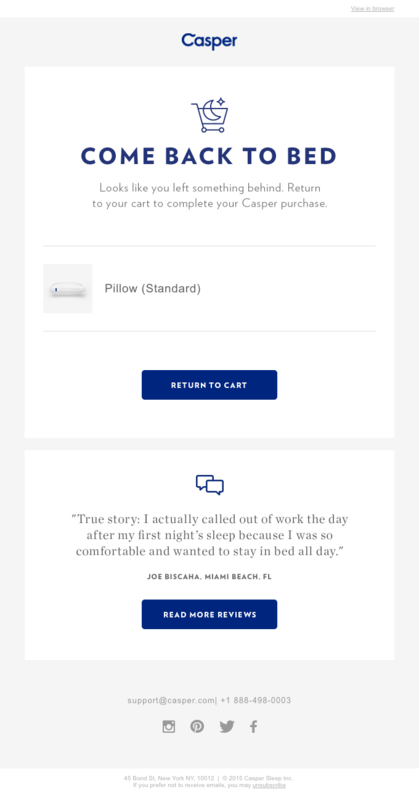 Customer onboarding is a challenging but also a rewarding process. In a relatively short amount of time, you’ll have to present the key benefits of using your service and convince them to try it out. Show them how enjoyable it is to solve their problems, and why they’ve made a good decision in becoming your customer. 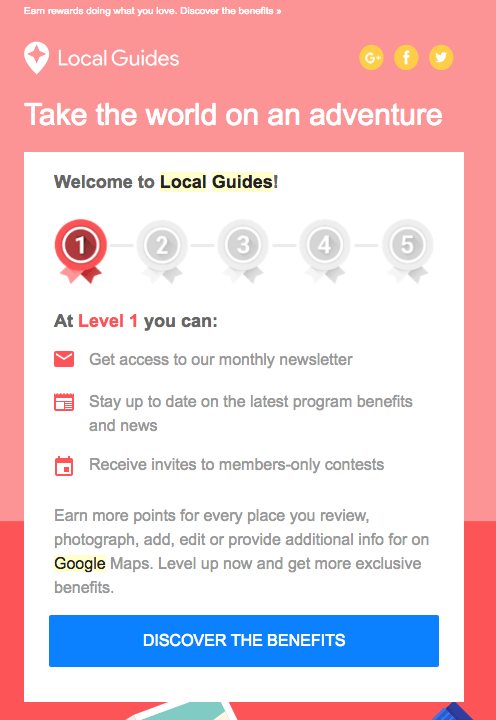 Below you’ll see some examples of emails that are sent to new users of Local Guides by Google. The next step towards getting your new customers hooked is to contact them exactly when they need it with the content they desire. Triggered emails do just that. If you notice that your new user goes through your site and visits a particular page, you can send him or her an email with a follow-up on the topic they’ve just researched. It could be, for example, a short video or recap of what they would have read, had they stayed on the page longer. You could also contact them after you’ve noticed they didn’t perform a desired action. For example, they started the process (e.g. building a webpage) but they didn’t finish it (in this case, publish the page). Re-engagement or reactivation campaigns are often considered a way to retrieve users who have long become dormant. While that’s one good use, it’s not the only one. Re-engagement can campaigns are also useful when you notice someone has stopped a process that could/should be a best practice. For example: they’re learning to code and get stuck in the middle of the next exercise. 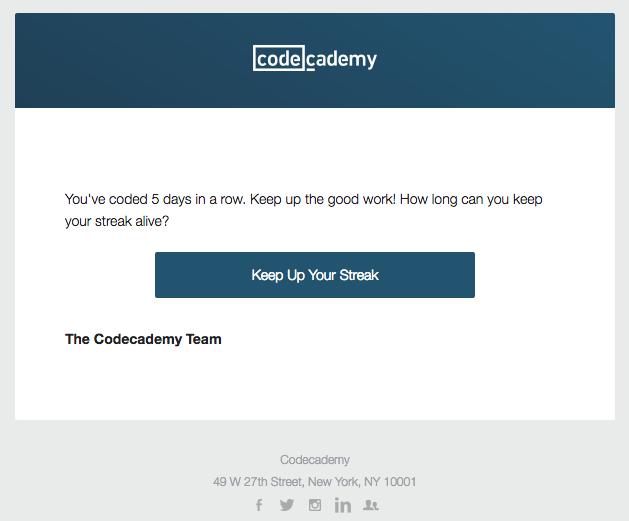 You can apply the same approach to keep your users engaged for longer. In other words, contact them with positive reinforcement, when they’re still actively using your platform. 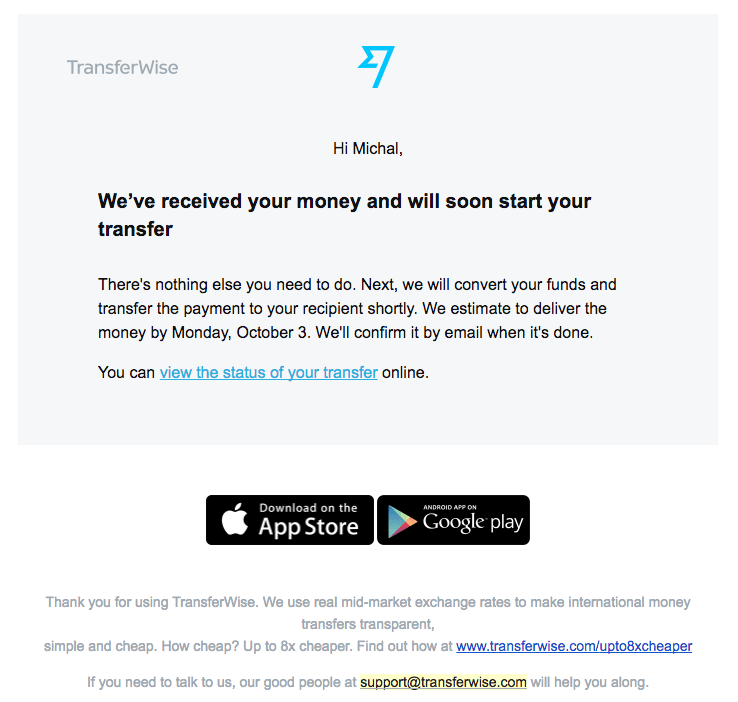 As you can see from the examples below, that’s exactly what Transferwise and CodeCademy have been doing in their campaigns. It’s not always enough to produce valuable content, FAQs, and tutorials to get news users to convert. Sometimes you need to reach out to them in person. In practice, it’s virtually impossible and would be inefficient to individually contact your new users. What you can do instead is use automated emails and in-app messages, offering a helpful hand whenever they’re in doubt. To make this tactic even more effective, make sure your messages look authentic, as if sent by an individual employee. That means if they decide to get in touch, they’ll know exactly who they’re talking to. What’s the best conversation you’ve ever had? Was it one where you were talked at? Probably not. The same goes for marketing: the brands that are loved the most aren’t the ones that talk at their users, but instead enter a dialogue. If you want your users to truly believe you care, give them a chance to speak up. You have to be transparent and show them that each voice will be answered. While you can achieve this by using Net Promoter Score and email surveys, it’s not enough to collect the opinions from your users. You have to also respond and reflect upon what you receive. 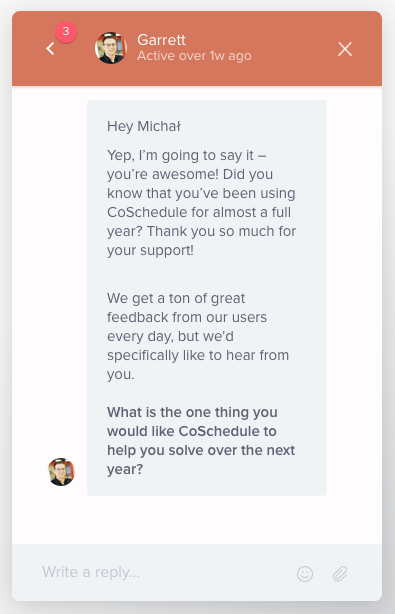 A great example of this approach is how social media scheduling company Buffer communicates with their audience. As you can see from this article, this approach paid off with great engagement and support from their users, even at times when their openness put them at risk of bad publicity. Now that you see how marketing automation can get users hooked on your product, what’s your next step? Are you ready to make a commitment to be open with your customer base, or will you only rely on transactional messages?